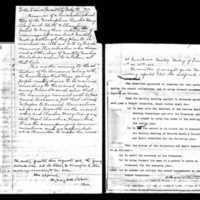 Two pages of church records from the Hicksite Quaker Church. Before his marriage in 1922, Charles Henry Craig (1896-1982) was admitted to the Hicksite Quaker Church on November 21, 1922. The application is included in these records. Craig was born on October 6, 1896, in Dixmont, Maine. He was drafted in 1917, and his service began on March 31, 1917. He served with Battery C 4 Field Artillery in the United States Army, but never went overseas. He was stationed in Justice Precinct 8, Bexar, Texas, in 1920, and was honorably discharged on April 6, 1920, as part of demobilization. After his discharge, Craig moved to Delaware, Pennsylvania, and married Edith Hazel Chambers on December 30, 1922, with whom he had four children: Charles (1923), Elizabeth Sarah (1925), Mary Louise (1927), and Frances (1936). In 1940, Craig became a principal superintendent of Williamson School in Media, Pennsylvania, while maintaining his job as a tree surgeon. Craig registered for the “Old Man’s Draft” for World War II on April 27, 1942. Charles and Edith moved to Florida by 1954. Craig passed away on March 9, 1982 in Hollywood, Florida, and Edith followed in March 1989. They are buried together in the Florida National Cemetery in Bushnell, Florida. 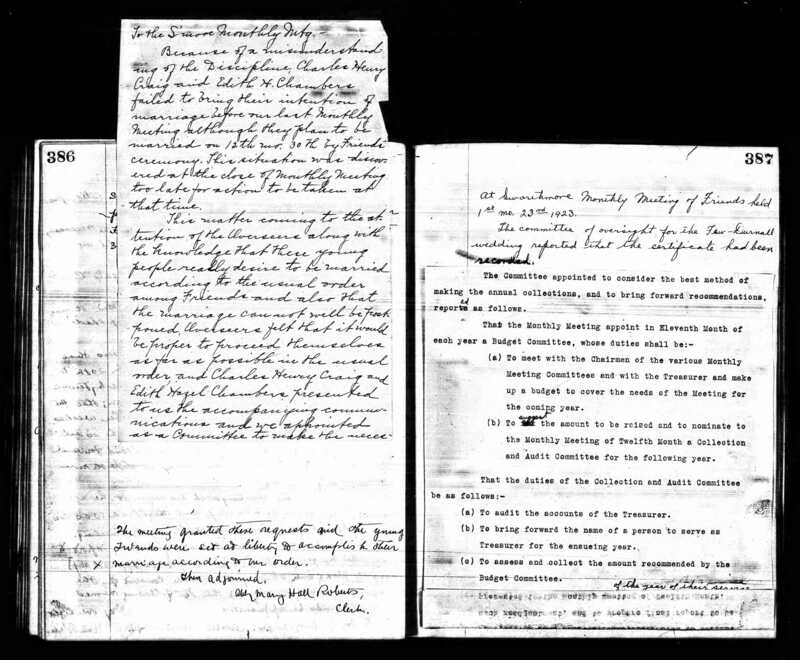 Digital reproduction of original church records, November 21, 1922. Originally created and produced by the Hicksite Quaker Church. Copyright to this resource is held by The Hicksite Quaker Church and is provided here by RICHES for educational purposes only. Abney, Barb. "VA Selects UCF Historians to Archive Stories of Deceased Veterans Veterans." UCF Today, March 13, 2017. Accessed August 9, 2017. https://today.ucf.edu/va-selects-ucf-historians-archive-stories-deceased-veterans/. Ingle, H. Larry. Quakers in Conflict: The Hicksite Reformation. Wallingford, Pa: Pendle Hill Publications, 1998. Hicksite Quaker Church . “Hicksite Quakers Church Records.” RICHES of Central Florida accessed April 21, 2019, https://richesmi.cah.ucf.edu/omeka/items/show/10166.